Elliot the therapy dog came to visit Natalie this morning. 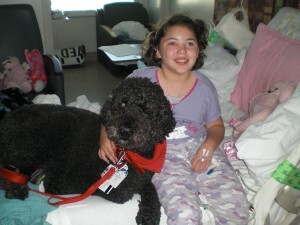 Elliot is a Labradoodle who works with Intermountain Therapy Animals at http://www.therapyanimals.​org/, he even has his own Facebook page at http://www.facebook.com/el​liot.therapydog. Joe is Elliot’s handler, and is a down-right good guy. Natalie was motivated to get up and sit on the side of the bed, then walk out to the NTU therapy gym with Elliot at her side. It’s the furthest she has walked since the Tuesday surgery.